Biosphere II was constructed as a demonstration/test site for prototyping sealed life support systems to support future space colonization, and to better model how earth’s ecosystems actually work. 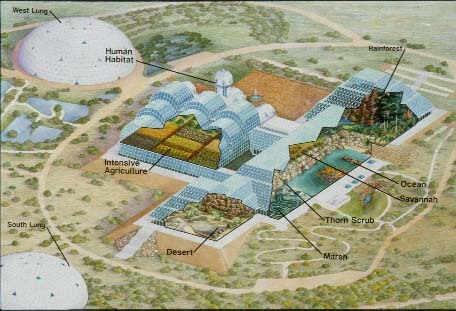 As a large glass building resembling a giant terrarium in the Arizona desert, it’s HVAC systems would have severe problems maintaining the tight control of temperature and humidity levels required for repeatable experimentation, and running the analyzer systems that monitored the environment for numerous chemical levels. HP was the prime contractor in providing computer systems, but they needed help in developing the custom software. We built software to control temperatures and humidities, to control the analyzer sampling systems, and to provide the graphical user interface for all monitoring activities. We also built simulation models to predict critical variables such as CO2 levels. The software was installed and worked as needed for the project. This project also inspired our research on HVAC systems, funded by NIST. A presentation made to NASA Johnson Space Center (pdf) summarizes this work. The work also inspired research leading to a government grant from NIST to study fault diagnosis in VAV (Variable Air Volume) systems, an advanced (but failure-prone) form of HVAC. The final report on that HVAC diagnostics study can be found at NIST Final Report: A New Methodology for Fault Detection Observers in VAV Systems .